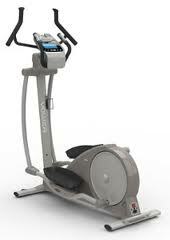 In addition to making quality elliptical trainers, Yowza also leads in developing new ways to stay fit. They recently introduced the Cardio Core concept and the Bonito elliptical trainer is the most economically priced trainer to include that feature. Whereas most elliptical trainers have upper body arms that move back and forth, the Cardio Core motion rotates your torso, working your obliques, part of your abdominal muscle area. In other words, your love handles are put on the spot while also increasing the cardio effort. Aside from the Cardio Core capability, the Yowza Bonita Elliptical Trainer has a full size stride length of 18 inches, with a reversible motion, maximum user weight is 331 lbs. Other valuable features on the Yowza Bonita elliptical trainer are both contact grips and wireless heart rate monitoring, docking station for music player and water bottle holder. The warranty on the Yowza Bonita elliptical trainer is reasonable for the price, lifetime on the frame, 3 years on parts, 1 year on labor.